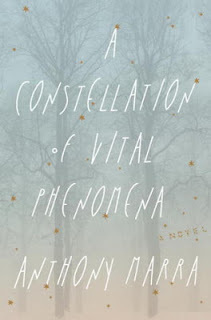 In his brilliant, haunting novel, Stegner Fellow and Whiting Award winner Anthony Marra transports us to a snow-covered village in Chechnya, where eight-year-old Havaa watches from the woods as Russian soldiers abduct her father in the middle of the night, accusing him of aiding Chechen rebels. Across the road their lifelong neighbor and family friend Akhmed has also been watching, fearing the worst when the soldiers set fire to Havaa’s house. But when he finds her hiding in the forest with a strange blue suitcase, he makes a decision that will forever change their lives. He will seek refuge at the abandoned hospital where the sole remaining doctor, Sonja Rabina, treats the wounded. What I knew about Chechnya could have fit inside of a teacup. "Oh yea, that place where there's been a lot of trouble. It's in Russia, right?" I have a much better grasp of the events there after reading this book. Marra explains the past of this country in an accessible and moving way. The story here isn't as much about politics and wars as it is about what happens to the people and their relationships because of such hardships. Marra focuses on the humans caught in these events. How do they continue to carve out a life in a war-torn country? How do they survive the fear? What sacrifices will they make to continue to feel like humans at all? This is an incredible story about a young girl and the man who decides to take care of her when she is left alone in the world. A Constellation of Vital Phenomena is powerful, emotional, and incredibly compelling. This novel is not to be missed. You'll be thinking of it long after you've read the last page. Stegner Fellow, Iowa MFA, and winner of The Atlantic’s Student Writing Contest, ANTHONY MARRA has won the Pushcart Prize, the Narrative Prize, and a scholarship to Bread Loaf. 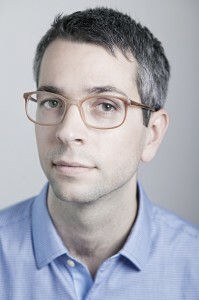 He is also the recipient of the 2012 Whiting Writers’ Award. He has studied, resided, and traveled throughout Eastern Europe. 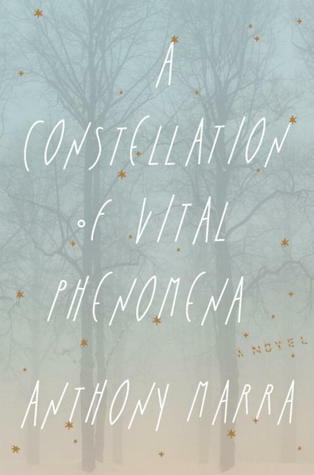 A Constellation of Vital Phenomena is his first novel. To visit the rest of the stops on this tour please visit TLC Book Tours. Such a good offer! I'm anxious to win. I haven't given this one much attention, I admit it. I keep seeing it pop up and I keep not really grasping what it's about. But I put on my big girl hat this morning and read your review, and I'm kind of fascinated by the fact that it gave you some insight and background on Chechnya. I am also one of the clueless. I just finished reading two graphic novels by Gene Yang and they gave me such beautiful, multifaceted background on The Boxer Rebellion...a time/event I was totes ignorant of. Cheers to the books that teach us stuff! See, that's another bit of history that I'd love to learn more about! I might have to look into those graphic novels for the next read-a-thon. I do hope you read this one Andi, I know you won't be disappointed! It's stunning, for real :) Good luck Kristin! Oh I'm so excited to start this now. I'm going to make sure I finish my current book today so I can read this one on the weekend! Can't wait to read this - been high on my list for awhile. Glad to hear it lived up to the hype for you! It's fab Greg, I hope you enjoy it! This book was one of the selections for the Powell's Indiespensible signed first edition club... on my "to read" list. I don't blame you, it's a powerful read :) Thanks for stopping Kerry! I just heard Michael & Anne from Books on the Nightstand talk about this book on their last podcast and requested it from my library (where there are a bunch of people a head of me already!). I liked this one, too -- reading it after the Boston marathon bombings was intense -- eye-opening and disturbing. Another win for Hogarth for sure. No doubt! Have you read The Headmaster's Wager? Swoon worthy! It really is Melinda, good luck!! Howdy! Thanks for having the giveaway. You're very welcome Rose, good luck! I'd be especially curious to hear what you think of this one Riv! I'm glad you enjoyed the book. I thought it was beautifully written and I learned so much about Chechnya! Good luck darlin'! Oh, that reminds me I need to go tweet about your giveaway again. I'm determined to win! I already have a copy, but I'm going to spread this around so that someone else can read it and enjoy! I like a book where I can learn things about another country and culture and really enjoy it! I know just what you mean Staci :) It's the best! This does sound like such a fascinating read. I've been seeing this book all over the place and wondered what it was about. Thanks for your review and the giveaway! You're welcome Laura! It's a GREAT book, good luck! I'm completely dumb when it comes to Chechnya so it sounds like I need to read this book! I've been eyeing this one, yay!! I don't blame you, it's a great book :) Good luck Monika! Howdy Gina! This is a great book and even if you don't win you should read it anyway :) Good luck! This sounds like a powerful read! I'm loving the cover and title too. Thanks for taking the time to read and review this powerful book for the tour! Absolutely :) It was my pleasure!